Waking up in the middle of Princes Street Gardens, with a layer of frost on my sleeping bag, the temperature being around -5°, and at just after 5.15am in the morning is not my normal idea of a Sunday morning. Last night around 8,000 people, myself included, took part in Sleep in the Park, which was an event geared around the phenomenal cause of helping eradicate homelessness here in Scotland. The event was organised by Social Bite, a charity café launched just five years ago in Edinburgh to help homeless people have access to food and employment and to engage with the problems we see on our cities’ streets. 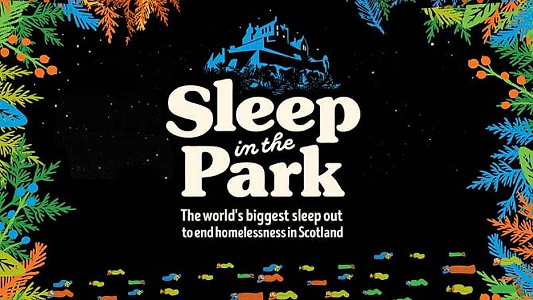 After a concert supported by top names in comedy and music, the main event was an organised sleep out – where attendees spent the night under the stars to put ourselves in the shoes of the approximately 300 people that sleep rough in Scotland every night. When it came for the actual time to sleep at around 11pm after the concert, it was a little strange. The festival-style atmosphere gave way to a strange sensation as everyone bedded down in cold, trying valiantly to pack into a sleeping bag and then again into a bright orange plastic “survival” bag we’d been given. The land had been covered in a black tarpaulin-style covering, which while making it softer and likely drier, did have the unfortunate side-effect of being slippy. Some made hay of this and had some impromptu sledging, but the joy was short-lived for most of us. After months of planning, the realities of the actual sleep out hit home to everyone. Some managed to get to sleep, but when the time came for me to actually find sleep, it proved impossible. The sleeping bag kept you warm to a degree, but the bracing cold made its way through anyway – nipping at feet and legs. The slippery tarpaulin meant that any movement sent you a couple inches further down the hill, so every so often you’d have to re-adjust and creep higher. I saw just about every hour on the clock as the night progressed, as the temperature continued to drop further and further below zero. This left plenty of time to reflect, and as much of an experience as this was, it pales in comparison to the conditions that most rough sleepers face. For us, we had sleeping bags, multiple layers of clothes, the ability to have hot drinks for free, the safety of medical staff and security being on hand. Then we also had the prospect that after our sleep out we get to go home. None of these things are available to rough sleepers – who face being attacked, who face another day of begging to muster enough money for basic sustenance. One night can’t possibly show what living as a rough sleeper would be like, but it certainly gave me a lot more respect for the plight faced by those in our communities. We had it easy in comparison, but it was definitely an experience that brought home why it’s so crucial that work be done to solve it. The event last night has so far raised over £3.6 million, and with fundraising open ‘til Christmas there’s a hope that the initial target of £4 million can still be achieved. With the money raised, Social Bite intend to create a village of houses that can be used to help the homeless find secure tenancies and begin to put their lives back together. The charity has also worked with housing associations to secure almost 500 other homes for those currently homeless, and the Scottish Government has pledged £50 million over the next five years towards tackling the root causes of homelessness. Myself and the team at TEFL Org UK are also close to our own goal of raising £3,000 for the event, and it would be fantastic if you could contribute whatever you can toward this cause via this Virgin Money page here. Luckily I’ll be able to get my own bed tonight, but for sure I’ll be thinking of the unfortunate few that won’t be able to do the same.